Welcome to Spaces VR! We are Courtenay’s first virtual reality gaming lounge, and with six room-scale VR spaces and two VR cockpits, we are the largest virtual reality experience provider in the Comox Valley. 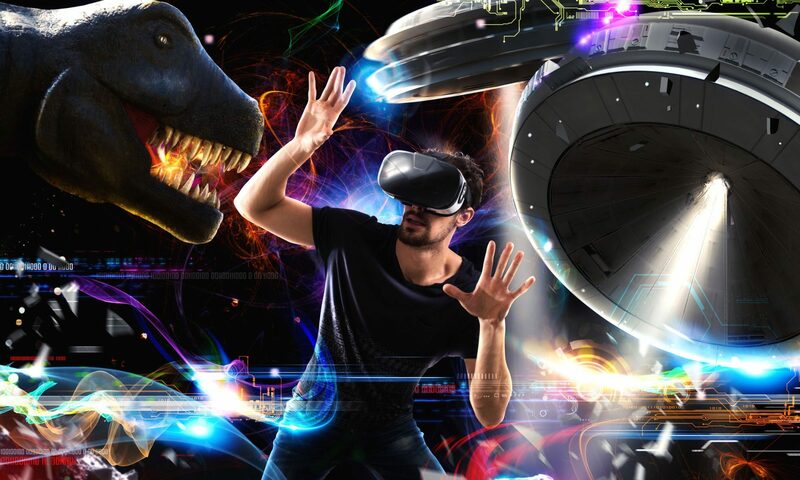 Visitors can rent spaces equipped with high-end VR systems and immerse themselves in another reality. You have to try it to believe it! We do parties! Come to Spaces for your next birthday party, sports team celebration, or team building session. We can also bring VR to your event. You can find us at 29th St and Cliffe Ave near the Great Canadian Oil Change. Call us during business hours at 250-871-1484. We are available for two-hour parties and to cater events seven days a week from 10 am until 10 pm but require one week’s notice for bookings that are outside our regular business hours. Up to three people can share one space at no additional charge. Please see our bookings page for information on making reservations. Whether you are celebrating a birthday, the end of the season, or a win at work, Spaces VR is the perfect place for your next party or team building session. We can also bring VR to your event. Email us at bookings@spacesvr.ca or call 250-871-1484 during our business hours to make your reservation. We are available for two-hour parties and events seven days a week from 10 am until 10 pm (require one week’s notice for parties outside of regular business hours). Feel free to bring in food and drinks. We have two VR systems for catering events, and can set up anywhere that we can get some covered space, power, and an internet connection (WiFi is fine). Click the Book Now button to book your VR space. Please choose to pay in store if you qualify for a discount (frequent player, student, promotional coupon). You can also make a reservation by e-mailing bookings@spacesvr.ca (please include full name and phone number) or calling us at 250-871-1484 during business hours. Drop-ins are also welcome! You will have to sign a waiver prior to using Spaces VR virtual reality equipment. If you are under 18 years of age, then a parent or guardian must also sign the waiver. You can sign the waiver online here. All children under the age of 12 must be accompanied by an adult for the duration of their visit at Spaces VR. VR headsets might not fit young children. We also encourage parents to research best practices and risks for children using virtual reality equipment. You can book our racing cockpits featuring Project Cars 2 by e-mailing bookings@spacesvr.ca or calling us during business hours at 250-871-1484. Please note that players must be around 4’10” in order to reach the pedals. Use the contact form below or email us at inquiries@spacesvr.ca. You can also call us during business hours at 250-871-1484.